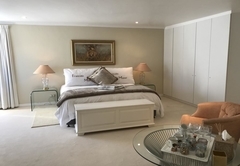 FrancolinHof Guest House is a 4 star graded B&B offering Hermanus accommodation in 5 guest rooms. 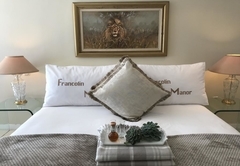 Get closer to South African nature at FrancolinHof, an owner-managed guesthouse overlooking one of the loveliest views in Hermanus of both the mountain and the sea. 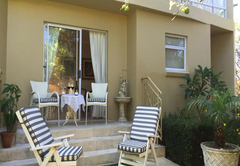 Ideally situated bordering Fernkloof Nature Reserve, FrancolinHof is surrounded by birdlife, proteas and other fynbos. 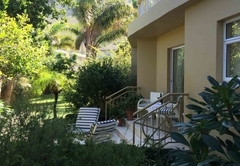 After sundowners on your balcony, a good meal and peaceful sleep far from the noise of traffic, you will feel refreshed to explore Hermanus or do one of the many activities accessible on site. These include a stroll onto the mountain from our garden - or a steeper climb for the more energetic - or a guided walk can be arranged to introduce you to the rich floral heritage of the Overberg. 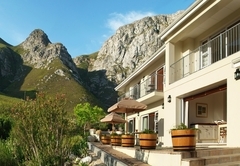 From all five luxury en suite rooms, patios and balconies enjoy sweeping views of the mountain and Walker Bay - and whales in the distance - during the day, sunsets in the evening and Hermanus lights at night. 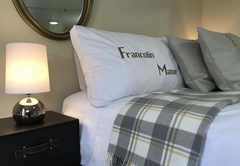 Each comfortably luxurious bedroom has the option of twin or king-sized beds and has a TV, mini fridge, hairdryer and tea/coffee-making facilities. 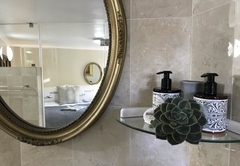 Heaters are installed and fans are provided as necessary, and there is underfloor heating and heated towel rails in all bathrooms. 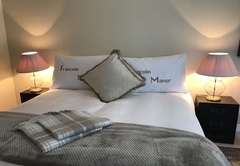 The lounge and dining area of FrancolinHof is wheelchair accessible, as is one of our en suite luxury bedrooms. 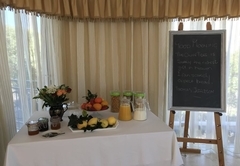 Breakfast includes healthy and hearty options with home-made and local produce. We consult a dietician for special dietary requirements on request. Picnic and sundowner baskets are available with advance warning. 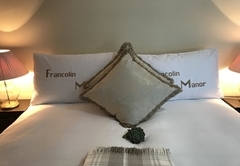 Relax in the peace and quiet luxury of FrancolinHof for this special time together. Take romantic walks on the beach at sunset or enjoy the view of the setting sun from your balcony or the Cliff Path with a Sundowner Picnic Basket, with our compliments for all couples spending a minimum of two nights of your honeymoon with us. 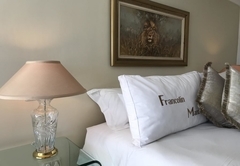 Hermanus offers a wide range of activities and restaurants - and at night FrancolinHof offers wonderful, romantic views of the lights of Hermanus across the bay. 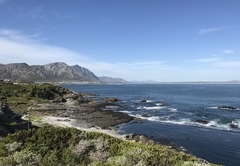 Two of the major attractions of Hermanus - the Cliff Path and the soft white sand of the Blue Flag Grotto beach are just a 10 minute walk downhill from FrancolinHof. The Cliff Path is 12km of undulating, fairly easy walking, starting at Grotto Beach and ending at the New Harbour - with the larger part of the path being between Grotto Beach and the centre of town at the picturesque Old Harbour. 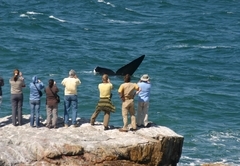 The Cliff Path is a prime whale watching site, walking path and location to enjoy sundowners. 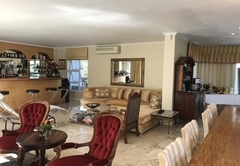 The restaurants in the centre of Hermanus and Hermanus golf course are about a 5km drive away, as are the beautiful gardens of the Fernkloof Nature Reserve. 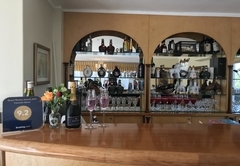 • the Hemel-en-Aarde wine valley with its wine farms and restaurants are about 12kms away. 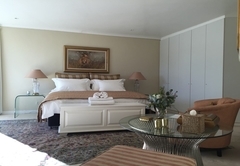 FrancolinHof is an excellent base to explore the many places of interest in the Overberg and South Coast. 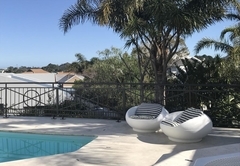 A little further afield and easy day trips include shark cage viewing and diving from Kleinbaai / Gansbaai, bird watching by dingy on the Stanford River, the penguin colony and Harold Porter Gardens at Betty’s Bay. 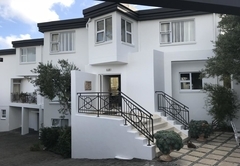 4X4 driving trail, the southernmost tip of Africa at Cape Agulhas, the caves and beach at De Kelders, the Mission station at Elim, candle factory shop at Bredasdorp, as well as the holiday villages of Greyton and Kleinmond. 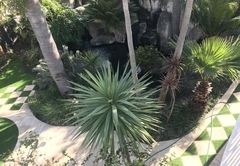 We will be happy to provide directions or make reservations for restaurant and activities for you. 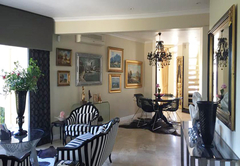 A very nice and comfortable house in a very nice town. Mary and Jean are the perfect guests! Every morning the breakfast was different yet always excellent, and the kids had a special surprise. 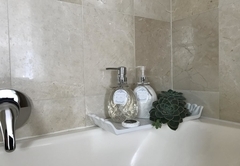 Loved the bathroom and the ground heating. Response timeFrancolinHof Guest House typically responds to requests in 5-10 minutes.